How children think is one of the most enduring mysteries-and difficulties-encountered by parents. In an effort to raise our children smarter, happier, stronger, and better, parents will try almost anything, from vitamins to toys to DVDs. But how can we tell marketing from real science? And what really goes through your kid's growing mind-as an infant, in school, and during adolescence? Neuroscientists Sandra Aamodt and Sam Wang (who is also a parent) explain the facets and functions of the developing brain, discussing salient subjects such as sleep problems, language learning, gender differences, and autism. They dispel common myths about important subjects such as the value of educational videos for babies, the meaning of ADHD in the classroom, and the best predictor of academic success (hint: It's not IQ ). Most of all, this book helps you know when to worry, how to respond, and, most important, when to relax. 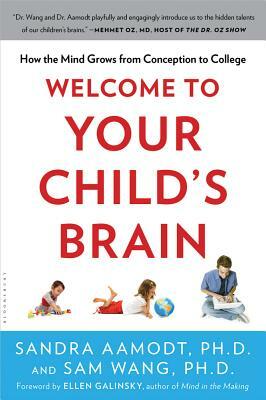 Welcome to Your Child's Brain upends myths and misinformation with practical advice, surprising revelations, and real, reliable science. It's essential reading for parents of children of any age, frominfancy well into their teens.